The Program in BioMolecular Research focuses on a medically important family of genes associated with mRNA stability and translation and are perturbed as a result of disease. 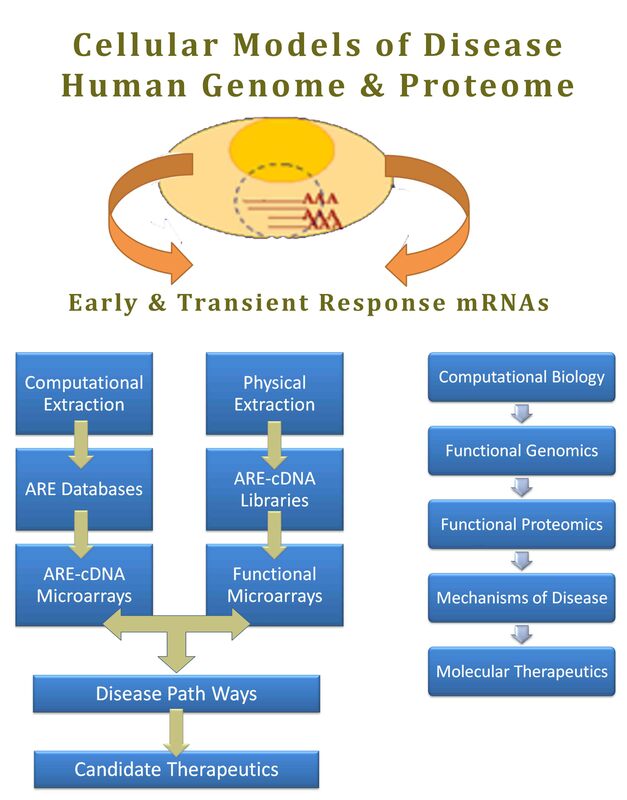 It employs the fields of functional genomics, functional proteomics, and molecular therapeutics to achieve this purpose by narrowing the human transcriptome and proteome into a focused workable model of transient response. Please feel free to browse around in our website and learn more about the program, its people and its projects. 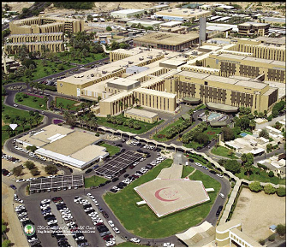 The King Faisal Specialist Hospital and Research Center (KFSH&RC) is one of the leading hospitals and research centers in the region. Situated on nearly a million square meters in Riyadh city with more than 7800 employees representing 63 nationalities. Although the Program in BioMolecular Research is one of the smallest department/section in the Research Center, it gained both national and international recognition. The program focuses on a medically important family of genes that code for what are called AU-rich messenger RNAs (mRNAs). These code for many proteins that are critical in maintaining healthy transient reactions during the body responses such as immune response and cellular growth. Disturbances in these transient processes may lead to unwanted prolonged responses and thus diseases, such as chronic inflammation and cancer. 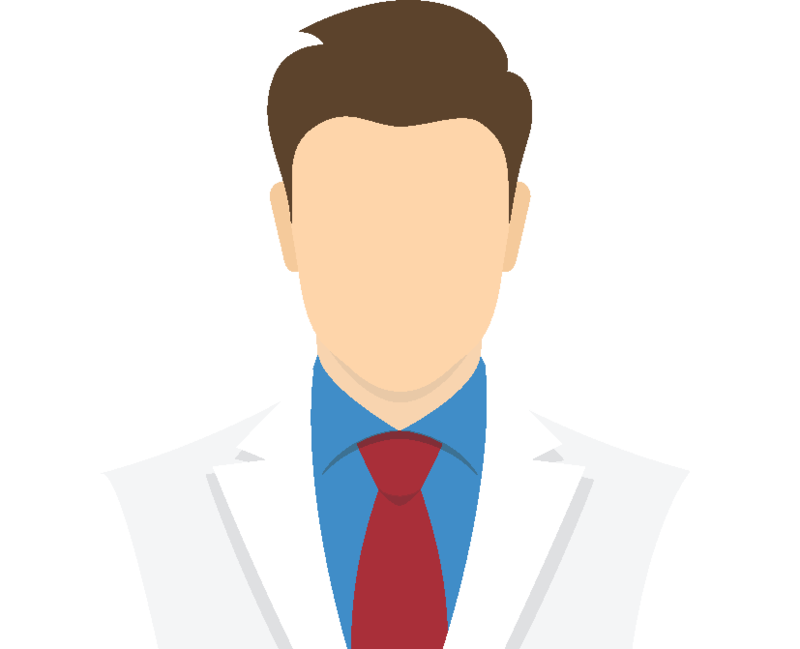 Thus, the program implements laboratory studies of this area in different disease conditions and pinpoint pathways that can be targeted for therapy. 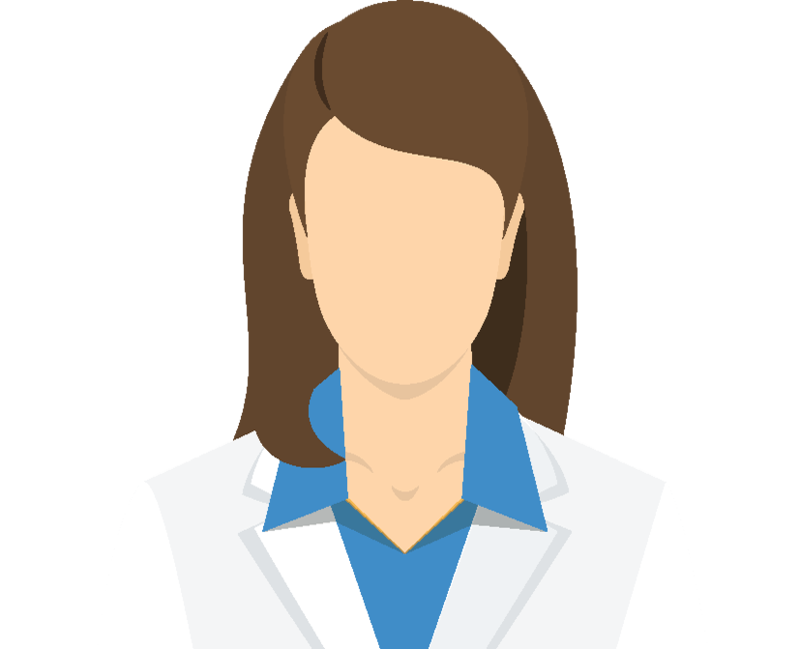 The research program employs the fields of functional genomics, functional proteomics, and molecular therapeutics to achieve its aim by narrowing the human transcriptome and proteome to early and transient response players. Using unique tools specific to the study of mRNA stability and/or translation that are developed solely by our program, our platform is internationally recognized as attested by the publications, collaborations, and grants. Provides bioinformatics support to the program by using algorithms to pinpoint the global distribution of early/transient response elements in mammalian genomes. Provides unique tools & methodology in the field of functional genomics & proteomics that support the original research and technology transfer projects. Study the role of transient response pathways in health and disease through a “system Biology” approach that utilize the above tools. Study the role of interferon and cytokine gene regulation in disease, particularly, in relation to innate Immunity, inflammation, and cancer. We use a unique research platform developed in our lab for the study of transcriptional and post-transcriptional regulation. The system integrates, Green Fluorescent Protein (GFP) as a reporter, automated imaging, in-house developed segmentation software for quantification, a unique non-inducible Promoter system and Taqman-based quantitative PCR. (alpha Innotech) High resolution and High throughput imaging system of slides and microplate. An automated high content cell-bases assay screening system. This system allows high speed, high-resolution confocal imaging capabilities coupled with powerful and flexible image analysis. High throughput robotics for liquid handling and cell dispending. This system allows the ability to process and study hundreds of research materials. Soley used for manufacturing of ARE-cDNA microarrays. Discovery of a novel regulatory pathway in cancer, which is auto-amplification of an RNA binding protein, HuR, which is important in growth of cancer cells. This finding is published in the journal “Oncogene” . Discovery of a novel mechanism for the tumor suppression by a gene product known as RNase L. This finding was published in the journal Nucleic Acids Research. Development of Cloning-free regulated monitoring of reporter and gene expression as method platform. This led to a publication in “BMC Molecular Biology” which was labeled as highly accessed and “TECHNICAL ADVANCE’ by Faculty of 1000 which highlights the top biomedical publications. This method was also previously filed in 2008 as a PCT patent application. Khabar KS. Post-transcriptional control during chronic inflammation and cancer: a focus on AU-rich elements. Cell Mol Life Sci. 2010 Sep;67(17):2937-55. Epub 2010 May 22. Al-Souhibani N, Al-Ahmadi W, Hesketh JE, Blackshear PJ, Khabar KS. The RNA-binding zinc-finger protein tristetraprolin regulates AU-rich mRNAs involved in breast cancer-related processes. Oncogene. 2010 Jul 22;29(29):4205-15. Epub 2010 May 24. Hitti E, Al-Yahya S, Al-Saif M, Mohideen P, Mahmoud L, Polyak SJ, Khabar KS. A versatile ribosomal protein promoter-based reporter system for selective assessment of RNA stability and post-transcriptional control. RNA. 2010 Jun;16(6):1245-55. Epub 2010 Apr 23. Cairrao F, Halees AS, Khabar KS, Morello D, Vanzo N. AU-rich elements regulate Drosophila gene expression. Mol Cell Biol. 2009 May;29(10):2636-43. Epub 2009 Mar 9. Al-Ahmadi W, Al-Haj L, Al-Mohanna FA, Silverman RH, Khabar KS. RNase L downmodulation of the RNA-binding protein, HuR, and cellular growth. Oncogene. 2009 Apr 16;28(15):1782-91. Epub 2009 Mar 2. Al-Ahmadi W, Al-Ghamdi M, Al-Haj L, Al-Saif M, Khabar KS. Alternative polyadenylation variants of the RNA binding protein, HuR: abundance, role of AU-rich elements and auto-Regulation. Nucleic Acids Res. 2009 Apr 14. Al-Haj L, Al-Ahmadi W, Al-Saif M, Demirkaya O, Khabar KS. Cloning-free regulated monitoring of reporter and gene expression. BMC Mol Biol. 2009 Mar 8;10:20. Nguyen Chi M, Chalmel F, Agius E, Vanzo N, Khabar KS, Jégou B, Morello D. Temporally regulated traffic of HuR and its associated ARE-containing mRNAs from the chromatoid body to polysomes during mouse spermatogenesis. PLoS ONE. 2009;4(3):e4900. Epub 2009 Mar 31. Kanies CL, Smith JJ, Kis C, Schmidt C, Levy S, Khabar KS, Morrow J, Deane N, Dixon DA, Beauchamp RD. Oncogenic Ras and transforming growth factor-beta synergistically regulate AU-rich element-containing mRNAs during epithelial to mesenchymal transition. Mol Cancer Res. 2008 Jul;6(7):1124-36. Papucci L, Witort E, Bevilacqua AM, Donnini M, Lulli M, Borchi E, Khabar KS, Tempestini A, Lapucci A, Schiavone N, Nicolin A, Capaccioli S. Impact of targeting the adenine- and uracil-rich element of bcl-2 mRNA with oligoribonucleotides on apoptosis, cell cycle, and neuronal differentiation in SHSY-5Y cells. Mol Pharmacol. 2008 Feb;73(2):498-508. Epub 2007 Nov 7. Halees AS, El-Badrawi R, Khabar KS. ARED Organism: expansion of ARED reveals AU-rich element cluster variations between human and mouse. Nucleic Acids Res. 2008 Jan;36(Database issue):D137-40. Epub 2007 Nov 4. Khabar KS, Young HA. Post-transcriptional control of the interferon system. Biochimie. 2007 Jun-Jul;89(6-7):761-9. Epub 2007 Feb 24. Khabar KS. Rapid transit in the immune cells: the role of mRNA turnover regulation. J Leukoc Biol. 2007 Jun;81(6):1335-44. Epub 2007 Mar 30. Ruggiero T, Trabucchi M, Ponassi M, Corte G, Chen CY, al-Haj L, Khabar KS, Briata P, Gherzi R. Identification of a set of KSRP target transcripts upregulated by PI3K-AKT signaling. BMC Mol Biol. 2007 Apr 16;8:28. Al-Zoghaibi F, Ashour T, Al-Ahmadi W, Abulleef H, Demirkaya O, Khabar KS. Bioinformatics and experimental derivation of an efficient hybrid 3' untranslated region and use in expression active linear DNA with minimum poly(A) region. Gene. 2007 Apr 15;391(1-2):130-9. Epub 2006 Dec 30. Ronkina N., Kotlyarov A., Dittrich-Breiholz O., Kracht M., Hitti E., Milarski K., Askew R., Marusic S., Lin L.-L., Gaestel M., and. Telliez J.-B. The MAPKAP kinases MK2 and MK3 cooperate in stimulation of TNF biosynthesis and stabilization of p38 MAPK. Mol Cell Biol. 2007 January; 27(1): 2399–2407. Wagoner J, Austin M, Green J, Imaizumi T, Casola A, Brasier A, Khabar KS, Wakita T, Gale M Jr, Polyak SJ. Regulation of CXCL-8 (interleukin-8) induction by double-stranded RNA signaling pathways during hepatitis C virus infection. J Virol. 2007 Jan;81(1):309-18. Epub 2006 Oct 11. Gherzi R, Trabucchi M, Ponassi M, Ruggiero T, Corte G, Moroni C, Chen CY, Khabar KS, Andersen JS, Briata P. The RNA-binding protein KSRP promotes decay of beta-catenin mRNA and is inactivated by PI3K-AKT signaling. PLoS Biol. 2006 Dec;5(1):e5. Green J, Khabar KS, Koo BC, Williams BR, Polyak SJ. Stability of CXCL-8 and related AU-rich mRNAs in the context of hepatitis C virus replication in vitro. J Infect Dis. 2006 Mar 15;193(6):802-11. Epub 2006 Feb 13. Bakheet T, Williams BR, Khabar KS. ARED 3.0: the large and diverse AU-rich transcriptome. Nucleic Acids Res. 2006 Jan 1;34(Database issue):D111-4. Al-Mohanna F, Saleh S, Parhar RS, Khabar K, Collison K. Human neutrophil gene expression profiling following xenogeneic encounter with porcine aortic endothelial cells: the occult role of neutrophils in xenograft rejection revealed. J Leukoc Biol. 2005 Jul;78(1):51-61. Epub 2005 Apr 4. Khabar KS, Bakheet T, Williams BR. AU-rich transient response transcripts in the human genome: expressed sequence tag clustering and gene discovery approach. Genomics. 2005 Feb;85(2):165-75. Khabar KS. The AU-rich transcriptome: more than interferons and cytokines, and its role in disease. J Interferon Cytokine Res. 2005 Jan;25(1):1-10. Raghavan A, Dhalla M, Bakheet T, Ogilvie RL, Vlasova IA, Khabar KS, Williams BR, Bohjanen PR. Patterns of coordinate down-regulation of ARE-containing transcripts following immune cell activation. Genomics. 2004 Dec;84(6):1002-13. Khabar KS, Al-Haj L, Al-Zoghaibi F, Marie M, Dhalla M, Polyak SJ, Williams BR. Expressed gene clusters associated with cellular sensitivity and resistance towards anti-viral and anti-proliferative actions of interferon. J Mol Biol. 2004 Sep 17;342(3):833-46. Asyali MH, Shoukri MM, Demirkaya O, Khabar KS. Assessment of reliability of microarray data and estimation of signal thresholds using mixture modeling. Nucleic Acids Res. 2004 Apr 27;32(8):2323-35. Khabar KS, Dhalla M, Al-Haj L, Bakheet T, Sy C, Naemmuddin M. Selection of AU-rich transiently expressed sequences: reversal of cDNA abundance. RNA. 2004 Apr;10(4):747-53. Khabar KS, Siddiqui YM, al-Zoghaibi F, al-Haj L, Dhalla M, Zhou A, Dong B, Whitmore M, Paranjape J, Al-Ahdal MN, Al-Mohanna F, Williams BR, Silverman RH. RNase L mediates transient control of the interferon response through modulation of the double-stranded RNA-dependent protein kinase PKR. J Biol Chem. 2003 May 30;278(22):20124-32. Epub 2003 Feb 11. Tebo J, Der S, Frevel M, Khabar KS, Williams BR, Hamilton TA. Heterogeneity in control of mRNA stability by AU-rich elements. J Biol Chem. 2003 Apr 4;278(14):12085-93. Epub 2003 Jan 28. Frevel MA, Bakheet T, Silva AM, Hissong JG, Khabar KS, Williams BR. p38 Mitogen-activated protein kinase-dependent and -independent signaling of mRNA stability of AU-rich element-containing transcripts. Mol Cell Biol. 2003 Jan;23(2):425-36. Bakheet T, Williams BR, Khabar KS. ARED 2.0: an update of AU-rich element mRNA database. Nucleic Acids Res. 2003 Jan 1;31(1):421-3. Khabar KS, Polyak SJ. Hepatitis C virus-host interactions: the NS5A protein and the interferon/chemokine systems. J Interferon Cytokine Res. 2002 Oct;22(10):1005-12.
el-Barbary M, Khabar KS. Soluble tumor necrosis factor receptor p55 predicts cytokinemia and systemic inflammatory response after cardiopulmonary bypass. Crit Care Med. 2002 Aug;30(8):1712-6. Khabar KS, Dhalla M, Bakheet T, Sy C, al-Haj L. An integrated computational and laboratory approach for selective amplification of mRNAs containing the adenylate uridylate-rich element consensus sequence. Genome Res. 2002 Jun;12(6):985-95. Polyak SJ, Khabar KS, Rezeiq M, Gretch DR. Elevated levels of interleukin-8 in serum are associated with hepatitis C virus infection and resistance to interferon therapy. J Virol. 2001 Jul;75(13):6209-11. Polyak SJ, Khabar KS, Paschal DM, Ezelle HJ, Duverlie G, Barber GN, Levy DE, Mukaida N, Gretch DR. Hepatitis C virus nonstructural 5A protein induces interleukin-8, leading to partial inhibition of the interferon-induced antiviral response. J Virol. 2001 Jul;75(13):6095-106. Bakheet T, Frevel M, Williams BR, Greer W, Khabar KS. ARED: human AU-rich element-containing mRNA database reveals an unexpectedly diverse functional repertoire of encoded proteins. Nucleic Acids Res. 2001 Jan 1;29(1):246-54. Murayama T, Mukaida N, Sadanari H, Yamaguchi N, Khabar KS, Tanaka J, Matsushima K, Mori S, Eizuru Y. The immediate early gene 1 product of human cytomegalovirus is sufficient for up-regulation of interleukin-8 gene expression. Biochem Biophys Res Commun. 2000 Dec 9;279(1):298-304. Khabar KS, Dhalla M, Siddiqui Y, Zhou A, Al-Ahdal MN, Der SD, Silverman RH, Williams BR. Effect of deficiency of the double-stranded RNA-dependent protein kinase, PKR, on antiviral resistance in the presence or absence of ribonuclease L: HSV-1 replication is particularly sensitive to deficiency of the major IFN-mediated enzymes. J Interferon Cytokine Res. 2000 Jul;20(7):653-9. Special Issue on The 50th Anniversary of Interferon Discovery: 1957-2007. Edited by Mounira Chelbi-Alix and Juana Wietzerbin Khabar KS, Young HA. Post-transcriptional control of the interferon system. Biochimie. 2007 Jun-Jul;89(6-7):761-9. Epub 2007 Feb 24. Hitti E., Kotlyarov A. The ERK and p38MAPK Pathways as Targets for Anti-Inflammatory Therapy. Anti-Inflammatory & Anti-Allergy Agents in Medicinal Chemistry. 2007 Feb. 6(1) pp. 85-97(13). COVER FIGURE: Rapid transit analogy with rapid activation and repression of gene expression. For more information, see "Rapid transit in immune cells: the role of mRNA turnover regulation" by Khalid S. A. Khabar, pages 1335-1344.